The 433 MHz Transmitter and Receiver are exactly tuned to the 433 Mega Hertz frequencies. The transmitter works off 5-12 volts and receiver at 5 volts. Battery power supply is ideal to reduce the noise. By increasing the Vcc of the Transmitter from 5 volt to 12 volts increases its range considerably. The Receiver requires 5 volts DC which can be obtained from a battery or a well regulated power supply with noise filters. Fig.1 shows the 5 volt regulated power supply for the receiver. 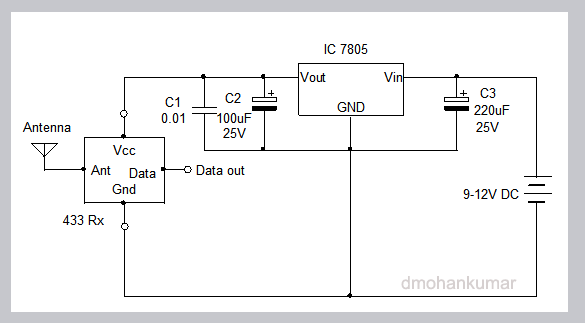 IC 7805 is used to regulate the input voltage of the receiver to 5 volts. C1, C2 and C3 removes noise from the power supply. The input voltage of the voltage regulator may be from a battery or adapter. Fig.2 shows how to remove the noise from the data out of Receiver using a Glitch remover. Capacitor C1, Resistors R1 and R2 acts as a very good Glitch remover that cleans the output of Rx to give clear data. But both these methods cannot remove the noise completely. 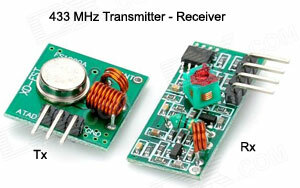 For that purpose it is necessary to modify the software of both transmitter and receiver in the Arduino software. 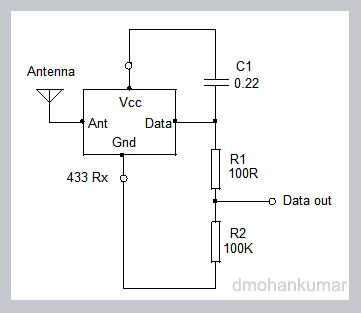 thanks for your info on reducing noise with this 433MHz receiver. Concerning that, I have a question: will this circuit increase the reception range rather by dozens of meters or just by a few centimeters to meters?